This scenario is a slightly modifed (simplified) version of a question posted in a discussion forum. Lets say I have a SQL Server 2000 box. And I have the following table. 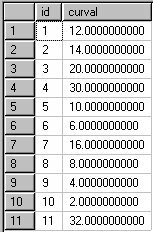 In the result, there is one calculated column called the average. where n is the id column. Its a performance intensive query and near implementation of a cursor solution (since it processes one row at a time). It won't work if the number of rows is more than 32767. What is the best possible solution (performance wise) that you can come up with? The implementation can either be for SQL Server 2000 or 2005. Works in either system. It works by having a think about what you're actually asking for. Very true, its not a running average. I was just coming up with a question. Not really a real time scenario.. Rob, beautiful dude. Just answer I had.. Here is my solution.. But, I think it can be improved. I guess we will be better off using a temporary table than this query. I tried doing a load test on this..
added a few more rows to the table with this batch..
Now I tried to run the CTE solution I gave and the other query with the join, and cte was performing much better. Though I would attribute it to the calculations in the latter, it calls for some serious thinking on when to go for cursors. A traditional cursor would be your best option. It's not limited to the recursion level. 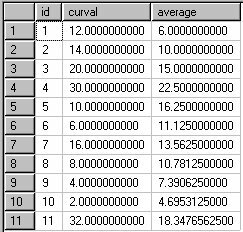 And yes, whenever you're doing running totals, a cursor becomes the best option for larger datasets. Recursive Self Join - A futile endeavor! !